This knife features a laser engraved image that gives a more personal touch to an already awesome product. First the image is engraved into the surface material of the handle panel at which point the second step is a specialized fill process which results in a unique look to the product's handle and an enhanced image. 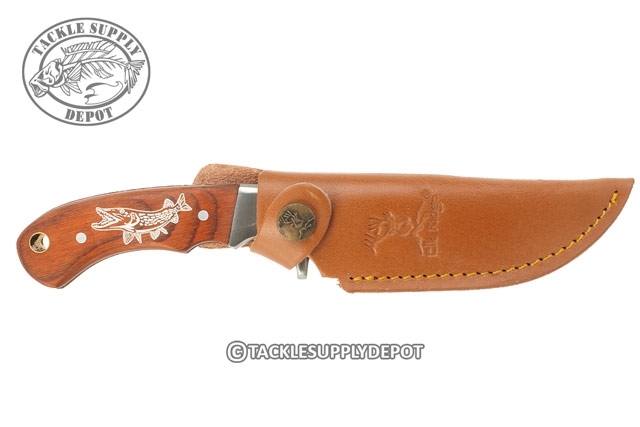 The Elk Ridge ER-052 is the knife made with the outdoorsman in mind. 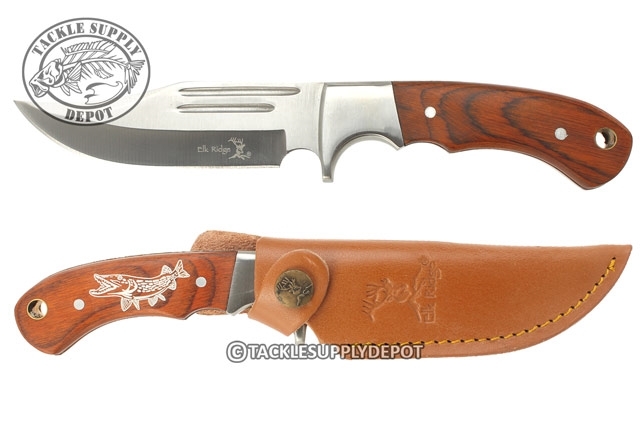 A 4.75 inch fixed blade knife which features full tang construction providing ultimate strength and durability. The Elk Ridge ER-052 comes in at just over 9 inches overall in length and weighs 6.95 ounces. Over the tang are two Pakkawood panels contoured with finger grooves for ideal comfort and purchase as well as an additional finger groove in front of the steel bolster for an even more precise handing when needed. The 440 Stainless Steel Bowie Style Blade features double blood grooves and a needle like tip. When out in the woods or even on the water a quality knife is a must and the Elk Ridge ER-052 is the ultimate choice when looking for both affordable and functional choices. 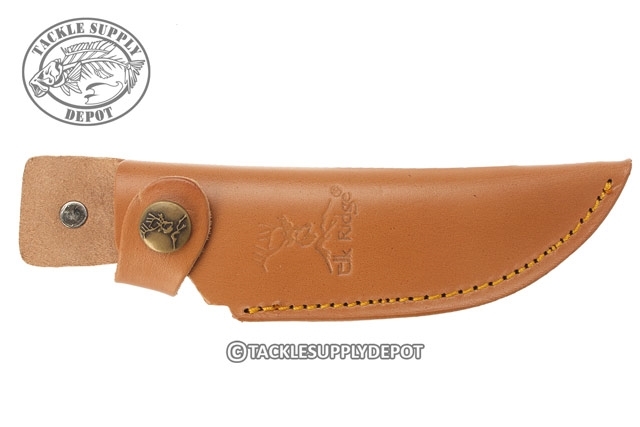 Each knife includes a leather sheath with button closure that secures the knife for per carry. Pakkawood is a combination of hard wood layers and resins fused together under intense heat and pressure. Multiple layers are combined to create very unique grain finish plywood which is inert, stronger than normal wood, more moisture resistant and will not warp. This in turn will last longer and overall look better, maintaining a long lasting natural high gloss finish which makes products using such material typically highly sought for gift ideas and collectables. Additionally due to the process each Pakkawood model is never quite the same as the next, with each layer providing a different layer of colors and grain patterns. Pakkawood is also known as Staminawood, Colorwood, Dymondwood and compreg.